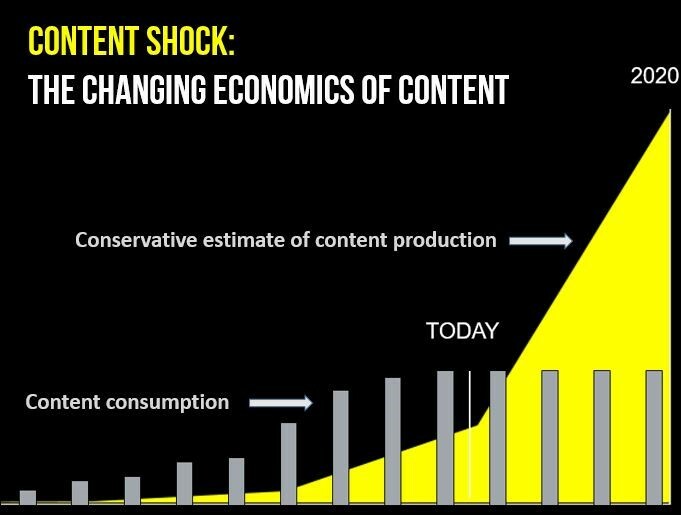 As more and more brands create more and more content, audiences already glued to smartphones, computers and TVs will literally reach peak content consumption levels. Schaefer’s forecast has indeed come true. Content marketing is now a zero-sum game, making everyone—including Netflix, your target audience’s friends and family, and the latest podcast—a competitor. Every second your target audience spends on someone else’s content makes yours less valuable, and there’s data to back this up. Don’t panic. This is not a death knell for content; it’s proof that success will come if you evolve with the content marketing landscape. Zeszut illustrates this herself, saying research shows that five percent of brand content accounts for 90 percent of engagement. This is more than a glimmer of hope. In fact, if examined through the right lens, it’s evidence that your content could become even more valuable to your brand’s marketing strategy. But how can you focus on creating only that five percent of ultra-valuable content 100 percent of the time? Data. It’s a one-word answer, but the implementation is quite a bit more complex. Publishing winning content piece after winning content piece requires the right tools and the construction of a data-driven content team, one that understands past performance, emerging trends, and ripe opportunities within your industry. The good news? Most brands already have many of the pieces. Here’s what to do with them. Identify the business objectives your content supports. Understand the metrics you will use to prove the failure/success of your efforts against those objectives. Your content team and your content strategy should hold both business objectives and metrics above all else—including creativity. Because creativity without business results equals failure. If business objectives and metrics are not at the core of your content strategy, it might be worth brushing up on the seven essential steps of content strategy. With business objectives and metrics as your pillars for success, you are now ready to source the data you need to show what is working and what is not. Your organization may have more data sources than you realize. Individually, they hold value, but companies that create synergies of knowledge from them have a better understanding of their target audience’s needs, the content that impacts bottom lines, and emerging trends that competitors have not yet recognized. Hopefully, your team already benefits from web analysis insights. If not, become best friends with your Google Analytics/Adobe Analytics (formerly Adobe Omniture) experts. Go buy them pizza and discuss how you can support each other’s needs. For each metric you need, identify the proper team or people who can source them. You may have to poke your head into many different departments to get this information, including finance, customer support, and sales support. Disclaimer: Though this article focuses on quantitative data, qualitative data can provide insights, too. For example, marketers can create better content by speaking with customer service, sales, and social media managers about what they see and hear in their personal interactions with customers and prospects. But, before acting on qualitative data, align your quantitative data with it to ensure what you’re hearing are issues customers actually have, and not issues you think they should have. Creating a data-driven culture can start anywhere in an organization, but C-suite buy-in is essential to bringing the necessary pieces together. After identifying your data sources, take the conversation to your CMO to ensure that she understands the ask you’re making of colleagues outside your department, and to request she have a conversation with other higher-ups who would otherwise hear grumbles and come to the defense of their employees. Remember, their employees will now provide you analysis on top of their day-to-day duties. In these conversations, be careful to relate your efforts to the company’s overall goals, not just those of marketing. How would you feel if IT requested you not put in tickets late in the afternoon so they could juice their stats? The conversations you have, and those you inspire the C-suite to have, may greatly impact other departments. A greater need for analysis could tip the scales to hire that new analyst a department has needed. It also helps cement analysts into the day-to-day of the company, giving them greater insights into their own data across different aspects of the customer’s journey. The people who hold the keys to your organization’s array of data sources likely get so focused in their day-to-day duties that they don’t see how the information they bury themselves in could be of value to others. It’s not intentional; people just tend to focus on what they need to meet their deadlines, exceed their goals, and make their bosses happy. Share the business objectives driving your content marketing strategy. Show how their work and data will play a role in supporting these objectives. Help teams and key personnel identify the success metrics you’re looking for. Be sure these metrics indicate outcomes (conversions, white paper downloads, etc. ), not outputs (deliverables provided, posts written, etc.) Also, be open to new metrics they may have to measure each business objective. 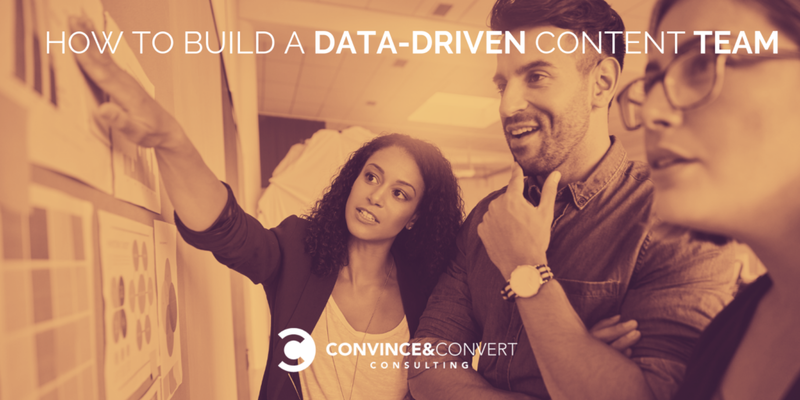 Through these three actions, you’re essentially showing the analysts and your entire department that you aspire to create a data-driven content marketing culture to push the company towards its C-level goals—the ones tied to profits and company growth. Establishing business objectives and key metrics is essential, but your content team also needs to heed these insights and build strategies based on them. If your analysts provide data that points to doing A, don’t turn your backs on it to do B. That move, as well-intentioned and reasoned as it may be, will breed distrust and resentment and could sink your data-driven intentions before they have a chance to deliver results. As you move forward, stay positive, and do not punish failure or point fingers at the people helping you. Work in concert with your colleagues to understand what went wrong and how to improve. If you followed the data and it didn’t work, revisit the topic and respectfully ask the analysts for their take. The collaborative process that takes place in success and in failure will bring your teams together. With organization-wide buy-in and a coordination plan, your analysts can now do the heavy lifting: identifying and pulling the proper data and metrics that showcase opportunity and content performance, as well as establishing the pathways to be able to do this. For example, your analyst may pull in leads from a marketing automation system (MAS) that is also tied to a CRM. In this case, your data needs to flow back and forth from the MAS to the CRM and still link back to article performance. This may require more time on their part, so it reinforces the importance of identifying the business impact of your content efforts up front. On the creative marketing side, content intelligence platforms like Ceralytics will help your team identify existing gaps in your coverage, the topics that differentiate your brand from others, insights into how your competition approaches content marketing, and the types of content and topics that result in increases of brand awareness, engagement, and conversions. Weekly meetings help keep the content team up-to-date with the performance of existing campaigns. Focus the meetings on the metrics of success that tie back to business objectives. Did a particular piece of content outperform expectations? Discuss why, and what iterations of that content could be created next. Did something under-perform? Dig into the specifics: Was it hitting the wrong channels, or was the topic just not something people in the industry care about? Also, use these meetings to discuss where a particular business objective may be falling short, and brainstorm new ideas on how to fill those gaps. If customer retention is falling, a data-driven content team can identify that trend at the same time as sales, and can proactively come to sales managers with potential solutions. Now it’s time for your content team to turn these ones and zeros into something creative, something that will drive results for your brand. Of course, that’s no easy task, but at least your data-driven content team, along with the rest of the organization all the way up to the C-suite, will know you have a strategy pushing your brand in the right direction. Brandon Andersen is an award-winning digital strategist with over a decade of digital marketing and product development experience. He is the Chief Strategist at Ceralytics, a content intelligence platform that uses predictive analytics to determine the topics that engage and drive your audience to take key actions. A self-described content marketing and measurement junkie, Brandon is always looking for new ideas and brilliant uses of content that tells a story.